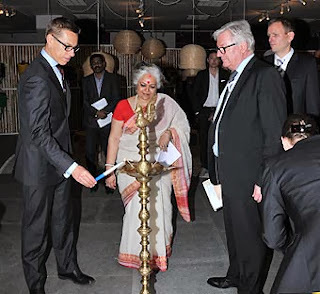 A 5-day design exhibition, organized by Finnish company TikauShare, focusing on sustainable living was opened at the India Habitat Centre in New Delhi on Monday. Affairs and Foreign Trade, Mr Alexander Stubb. The exhibition highlighted how the designs could be applied to entire systems and processes by responding to people’s needs and making their lives easier and more efficient in ways that they had not previously realised were possible. It showcased a variety of cases in which innovative design companies had responded to these challenges. The exhibition exemplified how sustainability was more than just a buzzword, giving concrete examples of how individuals and communities had benefitted from imaginative approaches to daily problems. It showed how design cannot proceed in isolation and the way best solutions involved collaboration between the designer, the solution producer and the end-user. The exhibition also focussed on the ways to provide sustainable employment and empowerment to Indian communities, the hygienic and eco-friendly conversion to compost of kitchen and toilet waste, and the provision of high-tech, user-friendly security devices. Among the key exhibits were the products designed by Tikau. The company has been working in and with Indian communities to produce top quality household items for its Helsinki-based retail business. The company invites top Finnish designers to create designs for lamps, carpets, cushion covers, scarves and other items. The designs are then adapted to the skills of about 120 India’s most talented artisan families, located in villages of West Bengal, Jammu & Kashmir, Karnataka, Gujarat and Odisha. The designs had been conceived in cooperation with the artisans, taking into account the need for villagers to work in or near their homes. Quality and sustainability have been central criteria for Tikau’s award-winning product range. Tikau means `sustainable’ in Hindi. By adapting age-old skills to designs with a modern sensitivity, designing with the villagers, not just for them, Tikau has also breathed a new life into cherished handicraft traditions. Artisans working from home use sustainable raw materials in their production, such as bamboo, which is plentiful and fast-growing in rural areas of India, and banana fibre, which is similarly abundant. Among other exhibits which attracted attention was Biolan’s low-cost `Composting and Sanitation’ unit. Exhibitors explained how one could easily convert household kitchen waste to usable compost in an efficient and affordable way. Also, they gave details on how to collect and compost toilet waste in locations that might not be connected to public sewerage systems in a clean, discrete and hygienic way. They explained how one could filter and purify “grey” waste water from washing, dishwashing and laundry processes. Biolan had been conceiving and developing products for ecological farming and green area management as well as environmental products. Based in Finland, where its garden composts and ecological toilets are well-known, Biolan emphasizes lasting values and ecology in its activities. Product development is a continuing process and quality assurance is systematic. Its activities are sustainable and Biolan operates in an environmentally and ethically acceptable manner in its own business area, minimizing and measuring the key environmental impacts of its activities. Biolan’s designers present a good example of how design has responded to both individual and national concerns for environmental cleanliness and sustainability. The exhibition also saw the international launch of Finnish company BiiSafe’s smart and stylish mobile accessory for personal safety. The compact and affordable accessory, built from high quality materials, has a variety of safety functions, such as location sharing and alert sending, and works with a single button. It can be adapted as a neckless, key ring, bracelet, or can be slipped in to a jacket or jeans pocket. The design exhibition also showcased low-cost earthquake resistant houses, constructed with local material like bamboo and mud. Designed by Earth House Systems, the houses can be set at a short notice. There are more than 1 billion families without a safe home in the world. The housing problem is a continuous problem where earthquakes, floods and other catastrophes, especially in developing countries, present an immediate need for emergency housing which can be upgraded to sustainable homes. Earth House Systems targets at the needs of humanitarian organizations, relief and peacekeeping tasks, governments and companies with Corporate Social Responsibility strategies, as well as those who need to solve housing problems in developing countries. Such structures need to be lightweight, easy to manufacture in large numbers, easy to transport and erect and locally and socially adaptable. The Earth House product is an ecological, safer alternative to tents and disposable temporary first aid and transitional shelters. It connects all needed local building materials and equipment. Unlike most building structures, EHS can be erected without special tools or professional work force, and it can be mass-produced locally at a low cost. EHS products are upgradable, reusable, re-sellable, and have seismic resistance. The average size of an Earth House is 40 square metres and costs about Rs 125,000 per unit. The building block for Earth House is from 1,000 houses and up to hundreds of thousands of houses, with clean water, sanitation hygiene, waste management and energy production.